Rev. 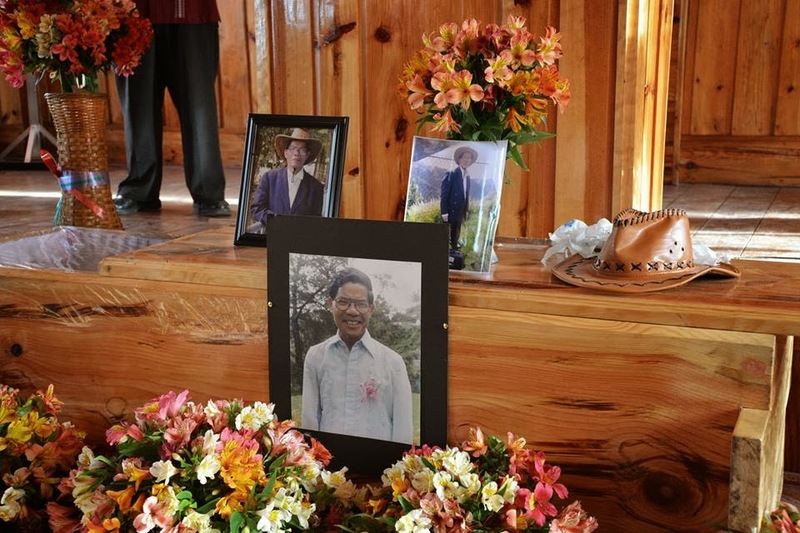 Rufino Wesley Duay Kimao (RWDK), the first Wesleyan Pastor among the Kankana-ey tribe in Benguet passed away on September 30, 2013, and was laid to rest on October 3 at Natubleng Buguias Benguet. The funeral service was conducted at the church he planted in the early 1980s. 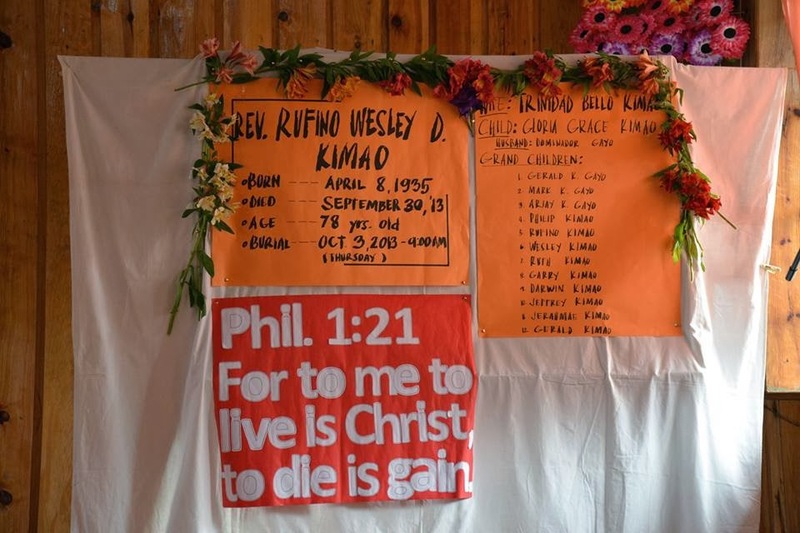 Pastor Wesley Kimao died in his sleep at age 78 while attending a funeral wake. What a good way to die! He did not have to bother anyone with any terminal illness or disease associated with senility. He had been pretty healthy all his life and he had been praying not to experience death but to experience the Rapture. God, however, did not answer his prayer of not experiencing death, but to witness the Second Coming alive. 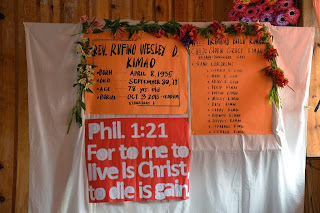 Rufino Kimao was born on April 8, 1935, the son of a pagan priest but was converted through the ministry of Rev. Bonifacio Urbano. Kimao was one of the earliest converts among the pagan, spirit, and Kabunian-worshiping tribe in Bakun Benguet. His birth place lies few miles away from Kabunian Mountain, where the Legend of Doligen transpired. When the first Wesleyan Bible School opened in Cabanatuan, Kimao was the first Igorot boy to study. 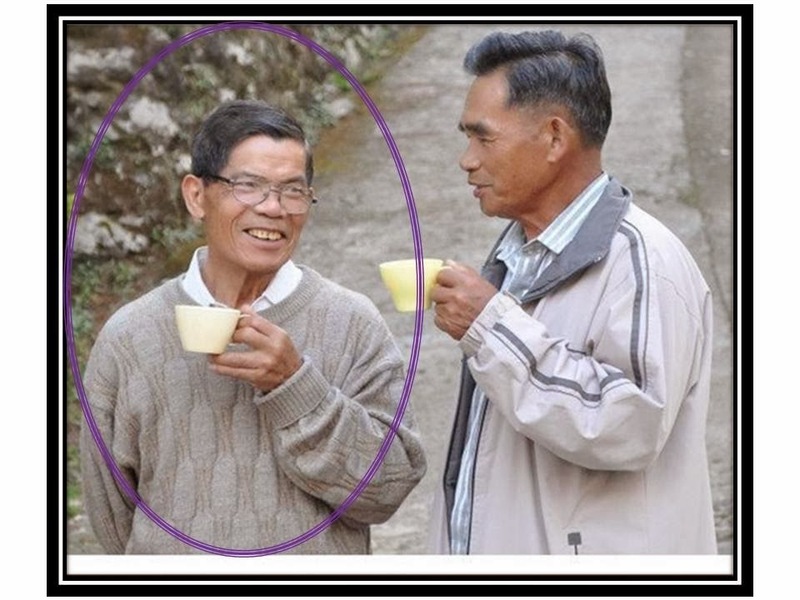 He was not academically astute but among his peers he was the most successful church planter and pastor. Pastor Kimao married Trinidad Bello from Mindanao, Southern Philippines. Though the marriage was prearranged, the couple had a successful marriage. They didn't have a biological child and had to adopt a girl. The couple named their adopted daughter Gloria Grace.The adopted child however was very wayward and did not become a blessing to them and to the church. Grace have 3 sons on her first husband and pastor Kimao took care of the first two. Rev. Wesley Kimao had a total of 12 grandchildren. Mrs. Trinidad Kimao died in the early 90s, and I spoke in one of the wake services. Following the death of his wife, the Rev. Kimao wanted to get a wife but was not successful in finding one. Rev. Kimao was an avid student of Bible prophecy particularly Eschatology or the Second Coming of Jesus Christ. Most of his treasured books in his library are about Bible prophecy. I remember buying a few of his books on prophecy 20 years ago. Rev. Wesley Kimao left no property or house to his daughter and eight grandchildren except his books and perhaps a little pension. It amazes me that uncle Kimao never worried about buying or building a house of his own. His example shows that it is possible for a pastor to give his life in a full-time service and ministry without a home of his own. Yet, while he left nothing in terms of material gain for his family, he left something more than money could ever buy; more than gold could ever purchase. He left the touch of heaven to his family and churches he planted and pastored. His legacy was over 10 churches that he planted in the Igorot world of the Cordilleras and hundreds of active followers of Jesus Christ to this day. 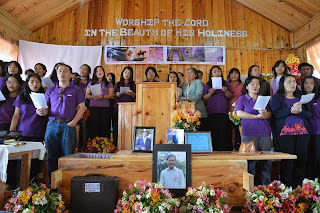 Among those over 10 churches, one exist in Baguio City, the summer capital of the Philippines. A friend of mine by the name Olnesio (Ernesto) Saliw-a was converted under Pastor Kimao's ministry in 1988, shared with me about his conversion experience that sparks my quest for salvation in Jesus Christ. Although, Olnesio didn't become a pastor he planted two churches, one exist in my own home village, Kayapa Bakun. Many of pastor Kimao's converts are also in the ministry today. What a life! While he had lived his life to the fullest, only eternity reveals his real legacy in the ministry. At the Judgment bar of God, the words of Jesus, "Well done, thou good and faithful servant. Welcome to the joy of the Lord", could be said of the Rev. Wesley D. Kimao.